To travel around Pattaya, you need to understand that the transportation is not well organized. There is no exact direction for public transport in the city as Song Taew, so it could confuse any visitors (not only foreigners, but also native-Thai speakers) who want to travel around Pattaya city. To help you more understand how to get around Pattaya efficiently, the information is divided in to 3 Sections – Song Taew (The most Popular of Pattaya public transport), motorbike taxis, and summary of structure of main streets in Pattaya. The most popular type of transport is Song Taew (Baht Bus), which can carry approximately 11-12 passengers (10 in the back, and 2 in the front of it). One person has to pay 10 Baht for this kind of transport.You can find Song Taews anywhere in Pattaya city, but these Song Taews do not have a fix direction to move around the city. So, although they circle around the city, you need to ask a Song Taew driver if he is going to a place that you are going to be. He would say no if he is going to the opposite direction of the visitors’ destination. This means that you should also understand the map of Pattaya in order to wait for the Song Taew in the right place (this side of the street or the opposite side, for example). In the case several of your friends and you come together, you can hire an empty Song Taew to go to a destination. This will be faster, but it will also be more expensive, usually more than 100 Baht, depending on the negotiable skill of yours. *Note that there is no Tuk-tuk provided in Pattaya. You can see the fundamental direction of Song Taew Transport services at Pattaya Map (Turn ON Song Taew Transportation). Motobike-taxis is another option to travel around Pattaya city. This will be more expensive than Song Taew (approximately 30-60 Baht), depending on how far you go, but it is definitely faster than Song Taew as well. You can find motorbike-taxis at every corner of the streets in Pattaya. It is easy to identify which ones are drivers of motorbike taxis because the drivers always wear colored vests. So, if you sees an empty-motorbike taxi is coming on the street in front of you, you can call or give a signal to the driver in order to pick you up as well. Motorbike-taxis usually take one passenger per motorbike, but sometimes they take 2 passengers if they can or if there is no motorbike-taxi left at the moment (the price these 2 visitors need to pay usually don’t reduce or reduce just a little though). However, please keep in mind that motorbike taxi is less safe than Song Taew. 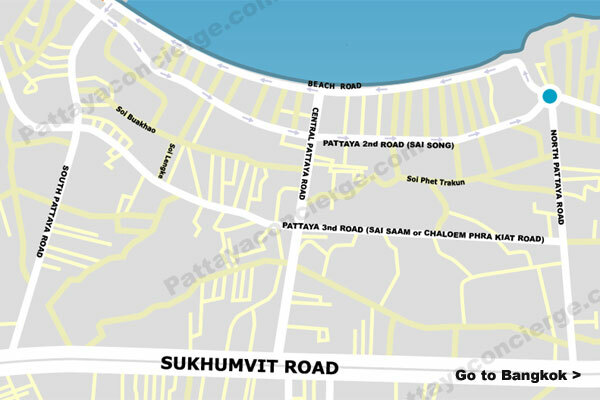 As mentioned above, Pattaya Road is what you need to know about. Firstly, Sukhumvit Road is a major street connecting to the highway to Bangkok. This street also connects to 3 main street of Pattaya city – North Pattaya Road, South Pattaya Road, and Central Pattaya Road. All of these 4 Streets are two-ways road. There are also other 3 main streets parallel Sukhumvit Road (or these 3 main streets can be used to move from North Pattaya to South Pattaya, or vise versa) – Pattaya third road, Pattaya second road, and Pattaya beach road. But what you have to keep in mind is that the 3rd road is the first street from the Sukhumvit Road (it is also two-ways road), the second street from Sukhumvit road is Pattaya 2nd Road, which is one-way road – the direction is from South Pattaya to North Pattaya, and the last one from Sukhumvit road is Pattaya Beach Road, which is also one-way road but the direction is from North Pattaya to South Pattaya. Jomtien Beach Rd., which is a two-way road, also parallels Sukhumvit Rd and is the only road in the Jomtien area, except for some connecting streets. On the other side of Sukhumvit road are several country clubs, golf courses and typical Thai rural villages, providing charming escapes on the banks of sweet-water lakes and small streams in the leisurely and relaxing countryside.